Let’s talk about two things that don’t go together very well — rubber roofing and the Texas weather. 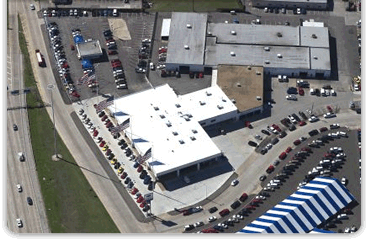 The summer weather in North Texas can be disastrous for your commercial rubber roofing. The heat this season will likely be severe, with temperatures for June through August expected to be above average in the region. Such high temperatures in the heat of the day are followed by significant cooling throughout the night, with fluctuations of nearly 100 degrees on a typical summer day. 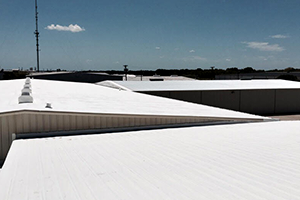 This causes roofing membranes, especially rubber roofing, to expand and contract repeatedly over the course of the season, and this is repeated year after year over the life of your commercial roof. That creates serious problems over time as rubber roofing ages. 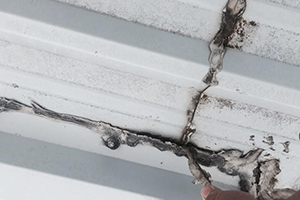 Failures in rubber roofing occur in two particular areas due to this shifting and flexing during extreme temperature changes. The first area of concern is at the seams joining the sheets of material, where cracks and leaks form as it elongates and contracts with the temperature. Second, failures occur around pipes and utility cables fitted through the membrane. The changing shape of the membrane due to heating and cooling puts strain on the seals around these openings as well. This is in addition to the already-constant threats of hail and wind damage we have to worry about in Texas. When we experience typical Texas downpours, water seeps in through weakened seams and cracks in your roof and begins to ruin the insulation and ceiling below. That water can then leak into your work area and cost you considerable money in repair bills (not to mention putting you and your employees at risk of a slip-and-fall incident). At that point, you have to consider whether entirely replacing your existing rubber roof is the right choice. However, often results in a large out-of-pocket expense since it can easily exceed your insurance coverage — not to mention the possible loss of time and money if you have to close your business for such a major repair. All of that combined might be too much for your business to afford. Rather than replacing a roof that’s failing due to age and weather, taking on that considerable expense and inconvenience, consider repairing it by having our team of experts install the GE Enduris Silicone Roof Coating System. The most obvious reason to choose this solution to your existing leaky rubber roof is that it forms a seamless system, solving the problem of leaks at the source. When applied, this liquid silicone coating fills in distressed or hail-damaged seams and troublesome leaks, forming powerful chemical bonds with the rubber roofing material already in place. Quite simply, eliminating seams means decreased vulnerability to leaks or hail damage, fixing the current problem areas and protecting against further leaking. The system is also especially good at reflecting UV rays, and adding the system to your roof can give your roof an ENERGY STAR qualification. 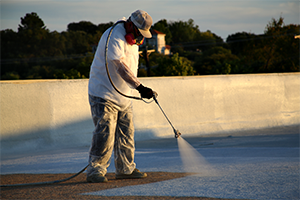 Since the GE Enduris Silicone Roof Coating System is applied as a liquid onto the surface of your existing rubber roofing membrane, it conforms to any slopes or irregular features of your commercial roof. It easily fills in and closes up the tricky crevisses and seals around openings for utility cables, hoses, or around air conditioning units, all of which form weaknesses in your roofing membrane when installed by opening holes in the membrane. Made by GE from 100% silicone, it’s flexible and offers best-in-class elongation. That means it can change shape with the expanding and contracting movements of your building that occur due to extreme temperature changes occurring daily, seasonally, and over the life of your roof. This system aids in the prevention of pooling water, faults, cracking, and leaks that so easily occur with an aging roof, adding increased protection against mold, mildew, rust, and wood rot. You get a seamless system designed to strengthen those specific trouble areas where leaks commonly occur. The GE Enduris Silicone Roof Coating System is completely UV stable, making it one of the most durable systems around. The white-colored coating helps to reflect the sun’s rays to lessen the effect of harsh temperature increases that occur during peak sunlight hours. We estimate as much as a 20% decrease in energy costs over a traditional black roof. The resulting savings in energy costs earn your roof an ENERGY STAR qualification and can even add a GE warranty to your roof for up to 20 years. In a place with severe heat like Texas, these are really great advantages over repairing your roof with more traditional roofing choices. 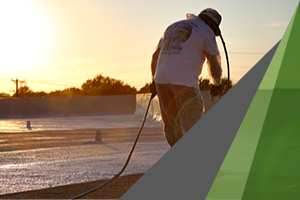 If you want to find out more about how the seamless GE Enduris Silicone Roof Coating System can protect your business from the intense Texas weather, plus how it adds an extended warranty to your existing rubber roofing system of up to 20 years, contact us now. Click here to set up a free estimate on a silicone coating system.